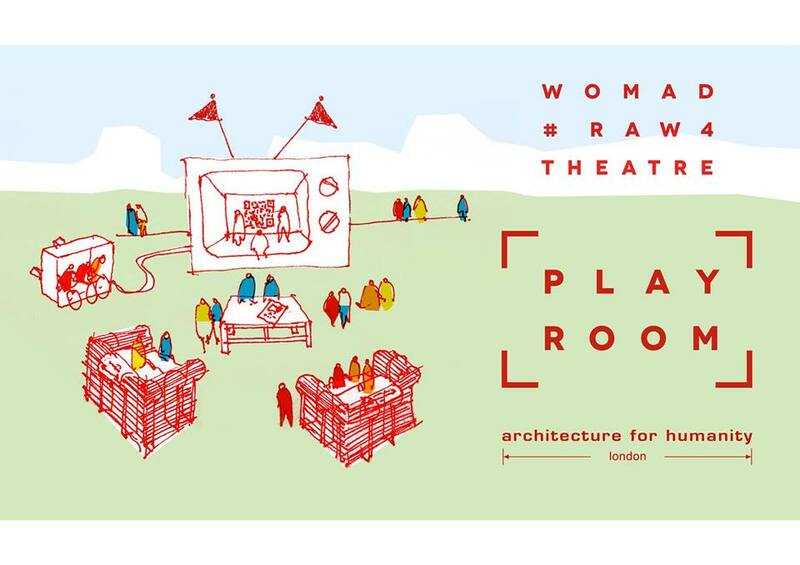 The Play Room idea was born from weeks of research and development, by a whole team of volunteers at Architecture for Humanity London. Our Theatre had several challenges including being pedal powered, by a 5 bike generator system with small PA. 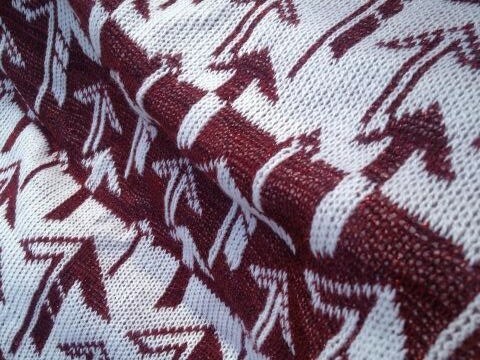 This was done by the amazing Cycletricity team (and I want one adapted for my next knitting machine!) The theatre did not have mains power, so reaching our audiences above and beyond the other festival noise was key. We also had to draw people to the site without obstructing any views, so the height, size and later silhouette, became very important. The stage also had to be fit for performance (Singers, bands, dance) with ground level for larger groups of performers (Shobas sung a great rendition of the ‘friends’ from the jungle book… to which I knew every word). We needed an eye-catching design and to quote our non-official project leader (who actually won the award), “Imagine if you were this big?” – said whilst making a hand gesture of pea-sized height, next to a small fabric sample or maquette. So the idea of scale and changing it continuously ran through our minds. As with Clerkenwell Design Week, we were adamant to create a combination of enclosed and open spaces which the wrapping of textiles led itself to whilst creating a more tactile space. 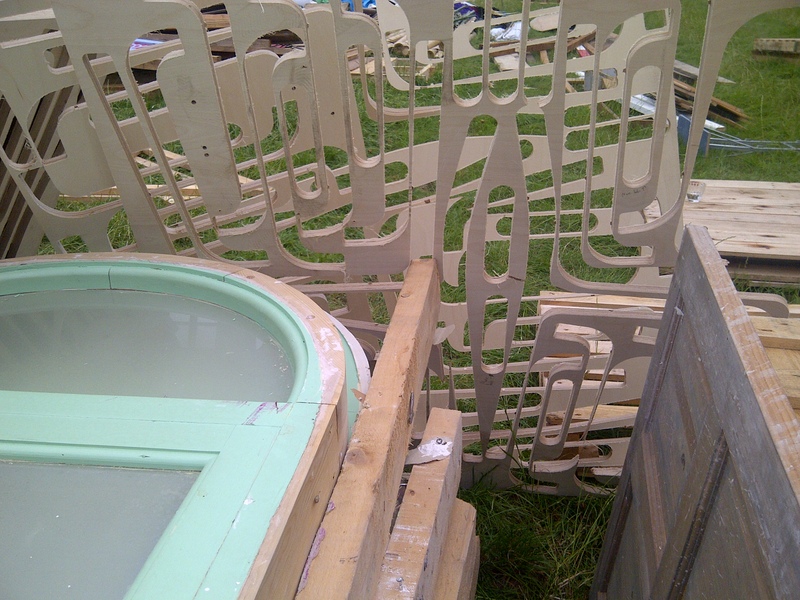 We were lucky we had sourced some of our materials beforehand for the theatre structure. 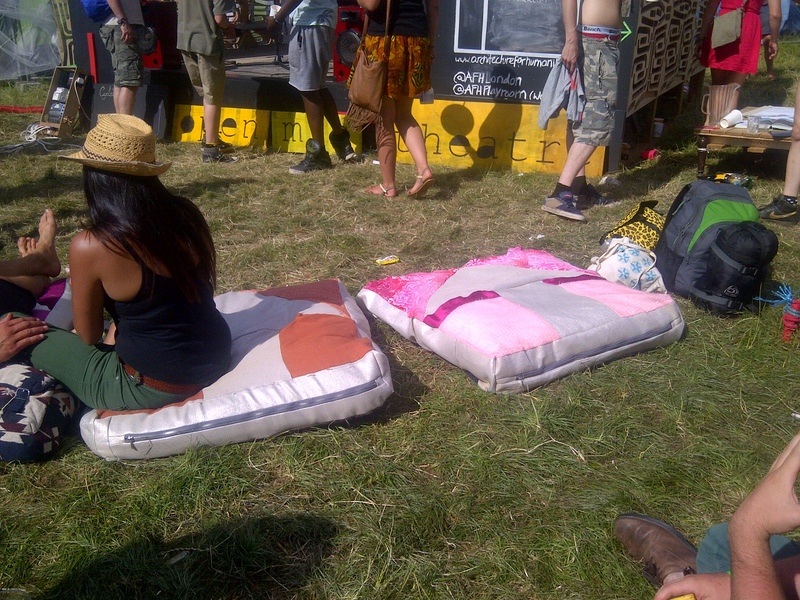 This was done at the Brixton Re-use Centre AKA The Remakery. ALL of the materials we used were either found or waste and were there to be reused in whatever way our creativity allowed us to. As we had organised a framework of scaffolding, wood and textiles for cladding as well as the materials which were available on site, it always felt like things were going to knit together nicely. The actual idea of a TV set and chairs was struck up brilliantly by a brainstorming session one evening! The stage became a vintage TV complete with giant silver aerials made from bamboo and wrapped in silver foil strips and finished with huge tomato tin cans. The TV itself had a scaffolding base which was then levelled, pinned down, reinforced by 2×4 and framed/ clad in ply offcuts from a furniture factory. The facade was scrap ply, painted in blackboard paint enabling us to use it as advertising board and a changeable set-list space. Our main seating also had a scaffolding base with two levels of seating as well as a third at ground level. These were then clad with armchair-shaped ‘profiles’ to create the overall look of an armchair. The vertical profiles were partially painted, either fully on one side or with an arrow across a few, creating the illusion of it pointing towards the stage. These acted as the warp of the chairs and by drilling through them, were then able to weave strips of fabric and yarn which acted as the weft, changing colour from top to bottom in a colour gradient. Combining all these elements, we were able to create a tiered seating space which appeared to be clad in a textile yet allow the audience from behind, the sides as well as inside the chairs, to look through or past them. There was a feeling of being shielded and covered by the armchairs even though they allowed you to look through them like little windows. Structurally it was important too as completely covering the chairs would have created problems with the wind (making the fabric into sails!) and also the rain (wet textiles are not great to sit on!). Keeping these theme of arrows (which linked nicely to the AfH logo), I set about designing and making some covered for the cushions which were donated to us. They were a nice comfy welcome-on-in! to our space and a luxurious change to the grass for the audience to sit on. I made them in 2 days, so they’re not top quality and will need editing, but they definitely served their purpose and added a punch of colour to the lower tier of seating. We also were able to create a coffee table, with a lower and higher tier which was half wood, have fabric clad and acted as a seat positioned directly opposite the stage and between the armchairs. 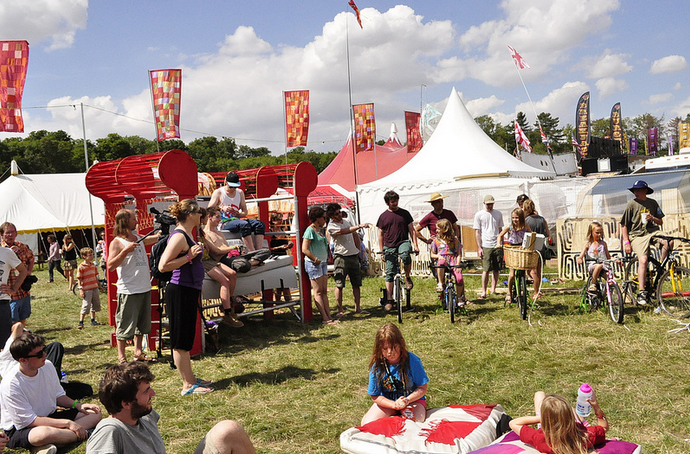 Also designed and made on-site was a giant lamp made from fibreglass rods, fabric, bamboo and HANGERS, used as sunshade throughout the festival, to complete our giant scale play room for all the performers, public and volunteers alike. 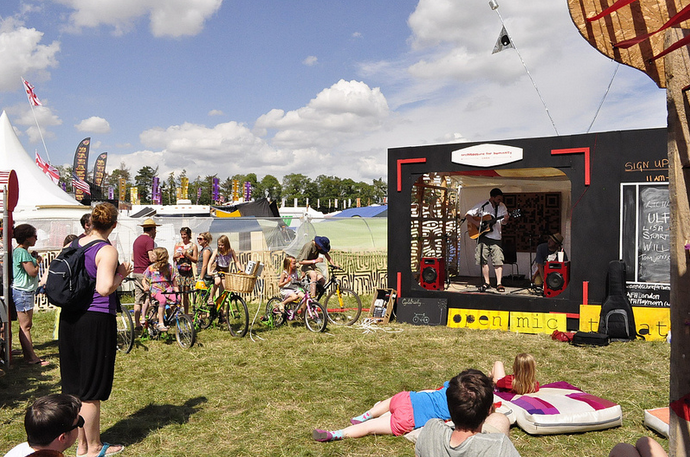 To complete our area we had the 5 bikes of Cycletricity powering countless performers, cycled by hundreds of people and giving a voice to alll the singers, musicians, joker and storytellers who wanted to perform at our Open Mic Theatre. Alongside our own build and team of 17, we had to cohesively work with the other organisations, which was great being part of a team of 78 people for 11 days. 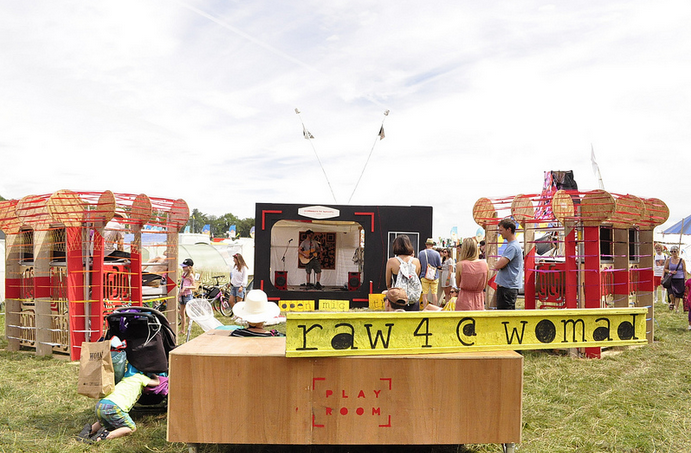 We created our own temporary community alongside our temporary structures which stretched the whole Tangentfield RAW4 site. The other teams created some amazing structures which included a workshop space complete with hazel-tunnel and rammed-earth wall at the Architecture Sans Frontieres Atelier. There were lectures and large workshops taking place at the Centre for Alternative Technology Speakeasy (with a club function for the evenings!) and a beautiful spiral, bamboo structure acting as a chill-out, interaction and canteen space created by at the Arkitrek team. (Please click on the links to view each of their Flickr photo sets). This whole event was about sharing knowledge, experience and skills as well as lots of fun, between ourselves and the public. It was a great team all round, great effort and I can’t wait for next year! 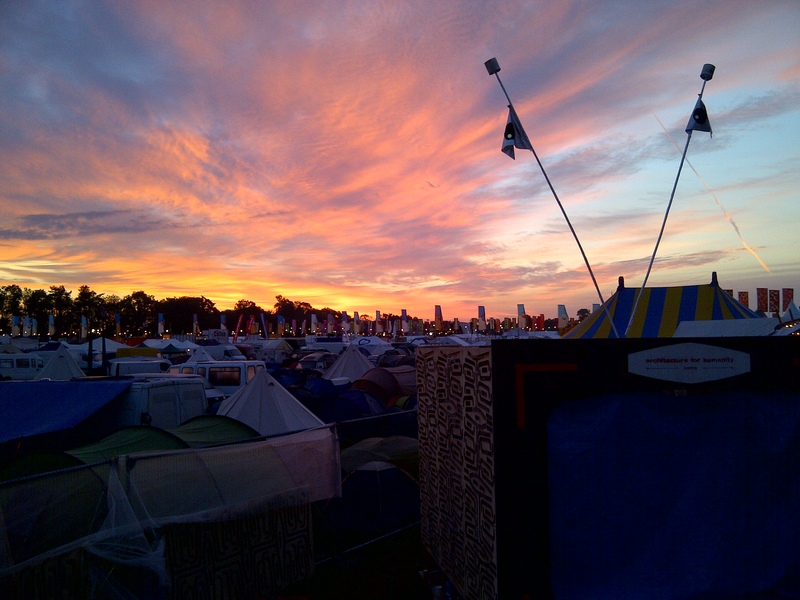 My post-festival-blues have solidly set in.